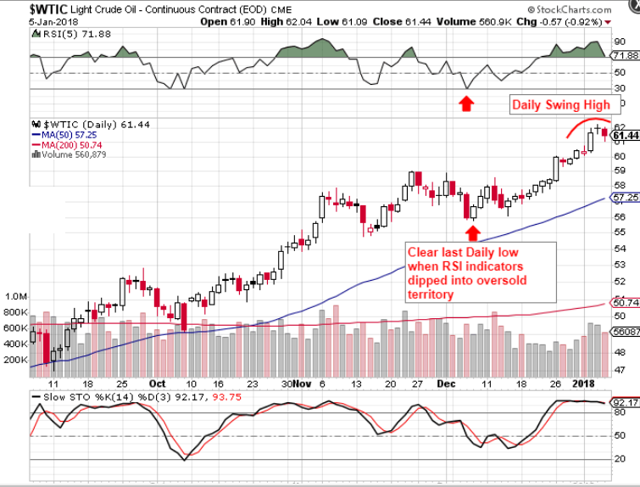 Crude Oil: Have We Seen The Top? 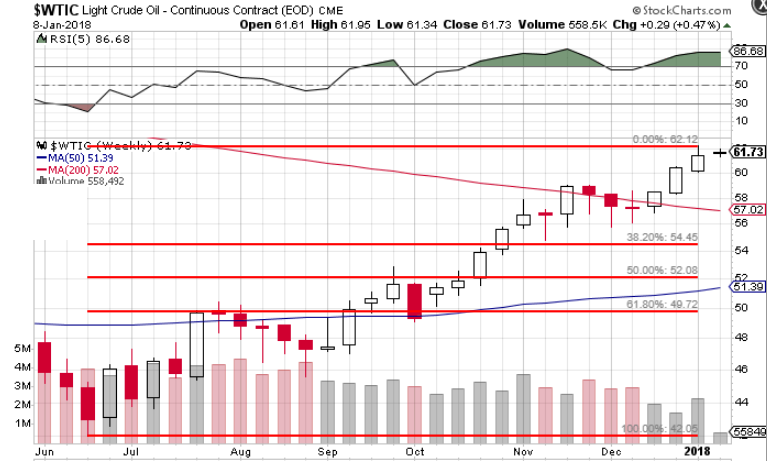 Crude oil has printed a a daily high but it is in jeopardy of being broken. An intermediate top though in energy should be close. Looking at a potential short play. Crude oil (NYSE:USO) actually printed a daily cycle top on Friday last. 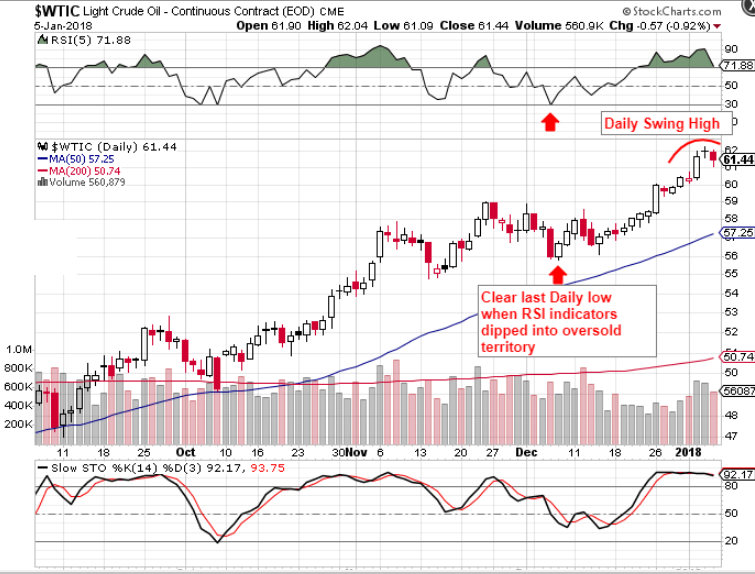 Now although a weekly swing high would be a far better predictor of declining oil prices, the problem with waiting for a weekly swing is that a lot of potential profit could be lost while one waits. Therefore, I'm looking at this recent daily swing high with particular interest because we definitely are in the timing band for an intermediate top. Here's how I see things shaping up in energy at present. First of all, from a sentiment standpoint, crude oil's long term sentiment readings haven't been this optimistic since mid 2014, which was just prior to energy's bear market (see below). I acknowledge that bullish traders will state that we are in totally different markets at present. 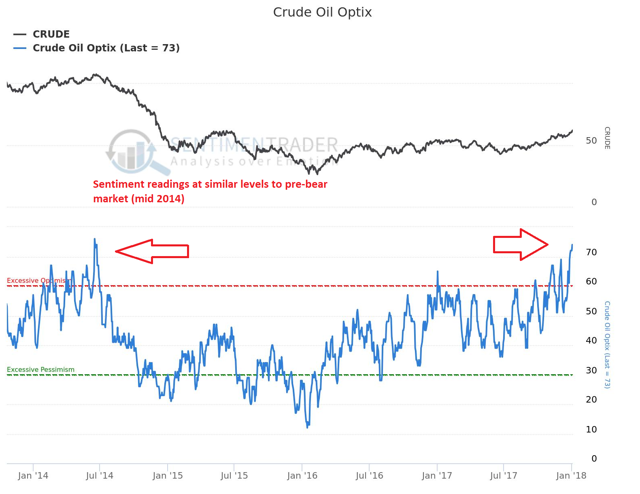 However, if you study the intermediate tops since the bear market bottom in early 2016, every intermediate top had excessive sentiment readings at the time, which eventually resulted in lower crude oil prices. Therefore, although the U.S. dollar, for example, is far weaker at present than what we have had over the past three to four years, this does not mean that crude oil prices will remain elevated in the face of ultra optimistic sentiment readings. 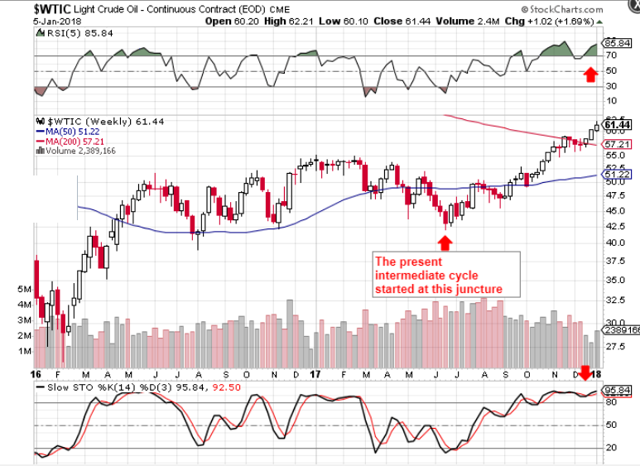 Like clockwork (every 30+ weeks or so), intermediate tops occur and almost invariably result in lower crude oil prices. Therefore the pending intermediate decline should not be any different. Sentiment readings in crude oil also match up with how crude is trading from a cycle standpoint. For example, the present intermediate cycle bottomed in mid-June of last year ( see below). This means that we are over 30 weeks into this intermediate cycle (or 6 months+), which means the top should be due now at any time. Also, as we can see from the chart below, the long term stochastics and RSI oscillators are heavily in over-bought territory. I would be looking for these to contract down back to over-sold levels before the next intermediate cycle begins in earnest. Therefore, we will see how trading in crude oil pans out over the next few days. We then will be able to make a decision whether we think this intermediate cycle has topped out or not. Nevertheless, if our timing is incorrect, you can be sure that we will have strict money management on this possible trade. We are particularly mindful of how strong stocks have been so far this year and crude oil could easily continue to rally alongside a weaker dollar which will mean more make higher highs. Therefore, we will adopt strict money management and, if stopped out of a position we will take that loss and move on. The 61% Fibonacci level though is less than 20% from crude's current spot price. This is why shorting can be very difficult - especially in markets that are making higher highs. Therefore position size here is imperative due to the potential reward. A 12 to 15% gain here would be plenty in this trade. Disclosure: I am/we are long SCO. I wrote this article myself, and it expresses my own opinions. I am not receiving compensation for it (other than from Seeking Alpha). I have no business relationship with any company whose stock is mentioned in this article.